Water baptism simply identifies Christians with Christ’s death, burial, and resurrection and is not part of the Gospel. By reading these seemingly contradictory statements together and considering each of the referenced scriptures, some people have concluded, “You can make the Bible say whatever you want it to say.” Sadly, that conclusion is quite true! In fact, some of the most egregious errors taught are simply Bible truths twisted to fit a particular and preconceived theological stance. To further complicate matters, far too many Bible teachers and students simply parrot what they have been taught rather than allowing the scripture to establish, define, and confirm or refute their position. The fact remains that you can make the Bible say whatever you want it to say simply by ignoring context or by twisting God’s intended meaning and purpose. Although it takes great effort to learn the Bible, neither God nor His word is ever self-contradictory as this work will endeavor to illustrate. People desiring spiritual truth can only acquire this truth through diligent search of the scriptures (John 5:39). Nevertheless, how each person approaches scripture determines the extent of truth derived. No teacher (other than the Spirit of truth) can be depended upon to give the truth infallibly (John 16:13). Men are but mere mortals, and this includes both teacher and student. Therefore, God called all to be students, but students dependent upon His help recognizing that both we and our teachers are prone to err. This book presents the scriptural teaching by which anyone, regardless of denominational affiliation, can determine the proper context when reading various Bible passages. This approach to Bible study, if done according to the divine mandates of God, yields sound doctrine along with proper application!!! It is not intended to be an end-all to Bible study, but simply a spring board. Likewise, it is not intended to be purely systematic producing some type of mindless robotic study. That has never worked! Hopefully, the material herein serves as a starting point for those seeking to grasp truths commonly overlooked and ignored. When the student takes the scriptural approach—rightly dividing the word of truth, he can reconcile what may at first appear to be contradictory scriptures. He can then easily recognize and understand the reasons for the differing beliefs or positions of the various churches and denominations. Once the student reconciles these scriptures, he can know and stand firm on the truth without being tossed to and fro by every wind of doctrine. 2 Timothy 2:15 Study (the biblical command) to shew thyself approved unto God, a workman that needeth not to be ashamed, rightly dividing (the instruction for how to study) the word of truth. Interestingly, not every version of the English Bible today offers its readers both commands—to study and to rightly divide God’s word. Far too many eager Bible students are left in the dark because the translations from the Alexandrian texts blur God’s intended meaning with unwarranted deviations from the truth. If these truths are indeed the keys to unlocking sound Bible doctrine and proper application (and they are), alternative readings handicap the reader. Christians trusting in those flawed expressions often fail to understand the need for “dividing” the scriptures. In missing this truth, Christians fail to grasp the difference between the various ages (and people groups) within scripture. Some of the most egregious false doctrines spring forth from these errors even though well-meaning people may be guilty of spreading these falsehoods. For example, replacement theology (the teaching that the Church replaces Israel as God’s chosen people) serves as a pervasive teaching with damnable heresies as the outcome. Most, if not all, of their false teachings can be refuted through this method of Bible study. Dividing God’s word to any extreme outside of the Bible’s parameters is both harmful to the body of Christ and detrimental to sound doctrine. Please understand that if the Bible can be rightly divided, it can certainly be wrongly divided. The Devil assuredly will bask in the ensuing confusion anytime the Bible is handled incorrectly. The point to always keep in mind is that dividing the Bible does not imply that some verses are unimportant or lack relevance. In fact, an overall guide for any Bible study should be to heed the admonition concerning the entire Bible found in the third chapter of Second Timothy. The reader should acknowledge and heed the scriptural admonition that ALL SCRIPTURE IS PROFITABLE and that all scripture is profitable first and foremost for doctrine! No scripture needs to be ignored or given any lesser degree of importance. The entire Bible, verse by verse, should be read, studied, believed, and taught. However, context is always the key! For this reason, this book emphasizes contextual Bible study which has been neglected or ignored for far too long by far too many Bible teachers. This study begins by presenting the following simplified timeline as a tool to help obey the command given in 2 Timothy 2:15. The timeline will be explained and developed in detail throughout this chapter and further expanded throughout the book. It is easy to prove that the Bible opens at the beginning (Genesis) and closes at the ending (Revelation). The problem occurs when people mess up the middle. 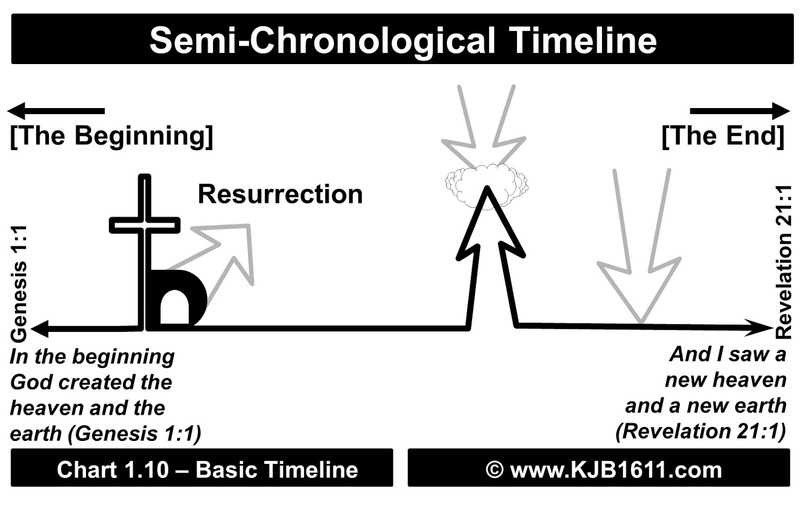 God laid the Bible out in a “semi-chronological” order from beginning to end. Timelines (used in this book), although imperfect, demonstrate the chronology of events contained within their related books of the Bible. 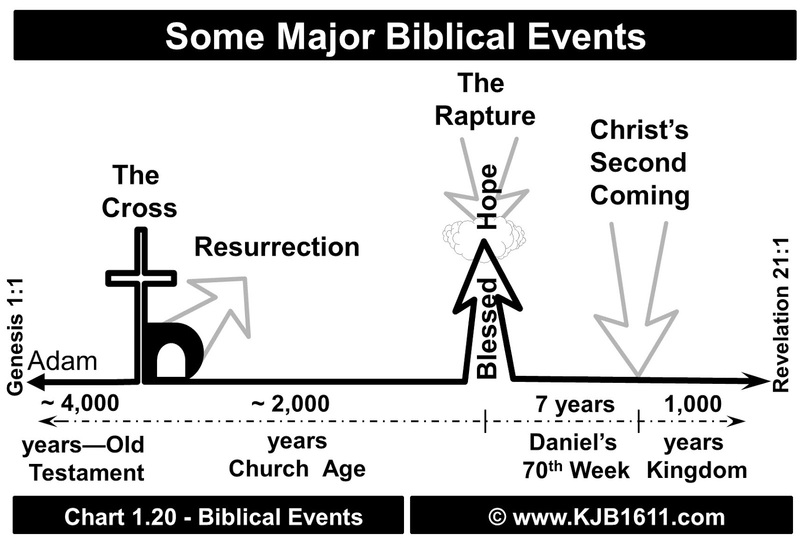 The far left of the first chart shows the beginning of the Bible record (Genesis). 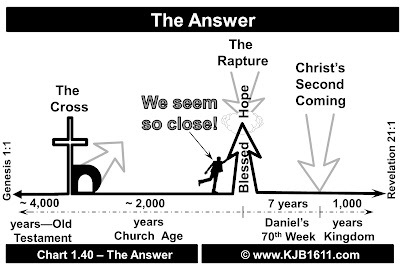 The far right of the chart shows the end of the Bible record (Revelation). As our study progresses, the intervening books of the Bible will be added to the timeline. To be perfectly chronological, each one of these books would have to begin at a point where the previous book ended. For example, the book of Mark would continue at the point where Matthew ended. 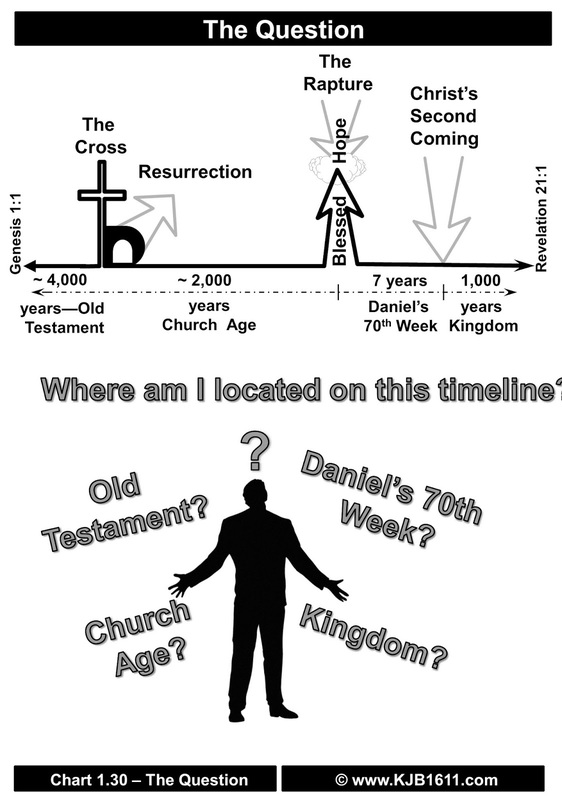 When considering the Bible on a timeline, it is necessary to group some books together (i.e., the four gospel books). These four books fall within an obvious chronology—their entire content follows after the events of the Old Testament. In addition, this group concludes with the ascension as also recorded in Acts chapter one (the next book). It is critically important to mention that this point does not preclude the four Gospel books from containing yet unfulfilled prophecies that fall outside this set time frame. In spite of the obvious chronology of the Gospels as a whole, they are not a continuous dialog when considered within their distinct section. Other sequential books of the Bible, that are not strictly chronological, are also divided into groups of books. These other groupings are developed later. · Jews under the Mosaic law? · Gentiles without the Mosaic law? · Jews enduring the time of Jacob’s trouble? · The earthly people dwelling within the future kingdom? The simple answer, No! Every passage of scripture does not equally apply to each of these groups. Therefore, as you read any passage from the Bible, ALWAYS consider this question: “To whom does this doctrine primarily apply?” There is no disputing the fact that the Bible contains scriptures which apply to groups of people in other time periods which are not directly applicable to the child of God living TODAY. Attempting to make everything apply to saved people today is New Testament Christian-centric and has produced some of the most damnable heresies and schisms. Understanding this concept serves as one of the key elements to uniting various groups to accept dispensationalism, that is, the study involving rightly dividing the word of God. To some extent, every Bible student believes in “rightly dividing,” otherwise, New Testament churches would meet on Saturdays, the meeting houses should be identified as “temples,” and these temples would have literal altars for animal sacrifice. Instead, every Bible believer recognizes Jesus as the perfect sacrifice knowing that Christ fulfilled the law’s demands in their entirety. Additionally, the Bible believer knows why the Christian church scripturally sets aside the first day of the week as its primary day of assembling and not the seventh day of the week (Mark 16:9; John 20:19; Acts 20:7; 1 Corinthians 16:2). As you will see in detail later, “rightly dividing the word of truth” begins by simply dividing the books of the Bible into sections based upon the primary group of people to whom God was/is speaking. Because the Bible contains material addressed to different people groups during various time periods, the student must be careful to keep in mind that the entire Bible is for you, but not all of it is written to you. With this foundation firmly established, we can explore some additional details added to the basic timeline chart. 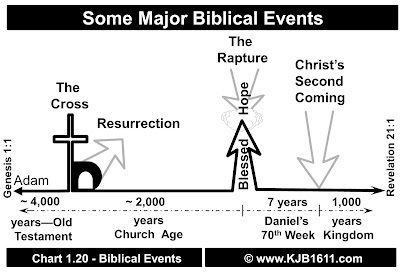 The first symbol on the chart (toward the left) signifies Christ’s death, burial, and resurrection which occurred approximately 4,000 years after Adam and about 2,000 years ago. (Combining the Old Testament genealogical expressions with our current calendars reveals that about 6,000 years have transpired from the creation of Adam to the PRESENT DAY.) The event recorded in the next passage took place about 4,000 years after Adam’s creation. Mark 16:5 And entering into the sepulchre, they saw a young man sitting on the right side, clothed in a long white garment; and they were affrighted. 6 And he saith unto them, Be not affrighted: Ye seek Jesus of Nazareth, which was crucified: he is risen; he is not here: behold the place where they laid him. 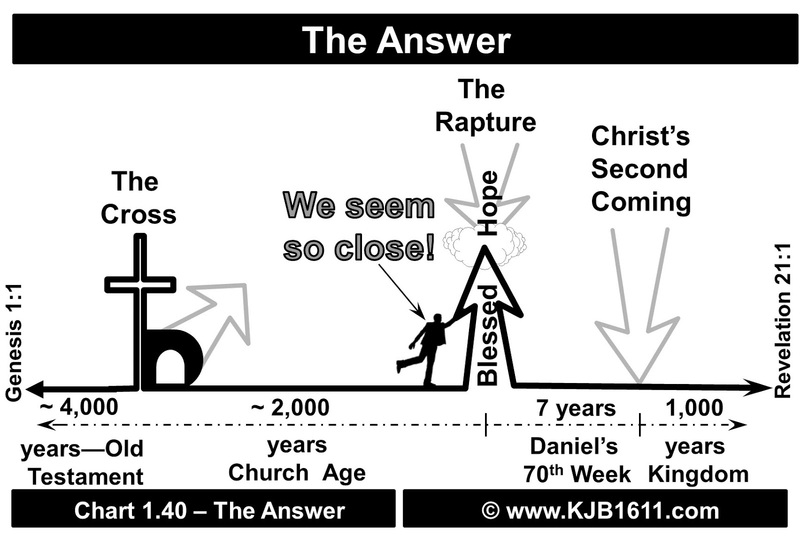 The period after the cross and prior to the Rapture/Blessed Hope is known as the Church Age. NOTE: Although the charts reflect some extremely defined lines and points, they are not intended to reflect pinpoint precision as to the exact timing of each and every event. This holds true concerning the details added to the charts later. It is simply impossible to predict the plethora of variants that people will read into a picture or a simple chart. The authors simply plead for some grace from their critics. Additionally, although the lines seem rigid and fixed, the groupings simply cannot reflect the many transitions from any one period to the next. Although the word “Rapture” is not found within the Bible itself, its use to describe a true biblical concept is as warranted as other acceptable terminology. For instance, most Bible students are also familiar with the word Trinity (also not in the Bible) which describes the three persons of the Godhead. The following are a few of the many proof texts for the Rapture with the key words of “gathering together,” “rise,” “caught up together,” “changed,” “raised,” etc. 1 Corinthians 15:51 Behold, I shew you a mystery; We shall not all sleep, but we shall all be changed, 52 In a moment, in the twinkling of an eye, at the last trump: for the trumpet shall sound, and the dead shall be raised incorruptible, and we shall be changed. 53 For this corruptible must put on incorruption, and this mortal must put on immortality. 54 So when this corruptible shall have put on incorruption, and this mortal shall have put on immortality, then shall be brought to pass the saying that is written, Death is swallowed up in victory. 55 O death, where is thy sting? O grave, where is thy victory? 56 The sting of death is sin; and the strength of sin is the law. 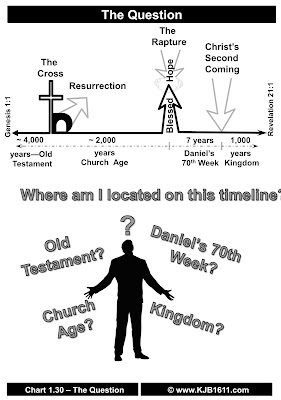 The period of time following the Rapture is known as Daniel’s Seventieth Week and lasts for a period of seven years. This period of time is most commonly referred to as the Tribulation, but this terminology has become increasingly confusing as some try to distinguish between the future period of time and the troubles faced by Christians throughout time. The third symbol, the single arrow pointing down touching the horizontal line, indicates the Lord’s Second Coming. It is important to distinguish between Christ’s coming for the Church at the Rapture where He meets the saints in the air versus the Second Coming where Christ actually comes back to the earth. The arrow touches the bottom line signifying that the Lord’s return here is to the earth and not simply to the clouds. Sometimes, the Second Coming is referred to as the Second Advent. Jude 14 And Enoch also, the seventh from Adam, prophesied of these, saying, Behold, the Lord cometh with ten thousands of his saints, 15 To execute judgment upon all, and to convince all that are ungodly among them of all their ungodly deeds which they have ungodly committed, and of all their hard speeches which ungodly sinners have spoken against him. Revelation 19:11 And I saw heaven opened, and behold a white horse; and he that sat upon him was called Faithful and True, and in righteousness he doth judge and make war. … 14 And the armies which were in heaven followed him upon white horses, clothed in fine linen, white and clean. The Second Coming prepares for and establishes Christ’s earthly, millennial kingdom. During the kingdom, the Lord Jesus Christ will reign upon the earth from His throne in Jerusalem. Among other events, the Great White Throne Judgment will follow the kingdom. The book of Revelation goes on to declare that this present heaven and earth will be destroyed by fire and will be replaced by a NEW heaven and a NEW earth. 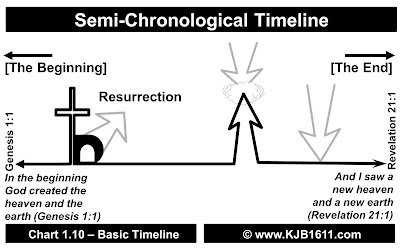 The timeline (chart 1.40) presently depicts the Church (in the period of time labeled “Church Age”) swiftly approaching the event called the “Rapture” of the Church Age saints. The following verses clearly indicate why we refer to this period as the Church Age. 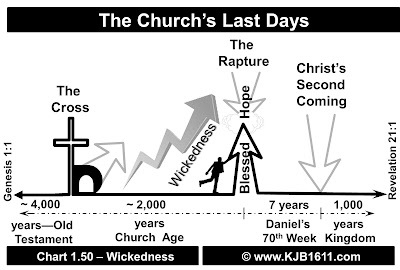 It is commonly believed that the Church Age will last approximately 2,000 years (Hosea 6:2; 2 Peter 3:8). This concept can be derived through the study of biblical principles and natural patterns. Seven is God’s number of completion (seven days of creation, seven days in a week, seven years in Daniel’s Seventieth Week, seven colors of the light spectrum and rainbow, seven notes of the musical scale, etc.). Note: This numerical study is not an attempt to date the Rapture or Christ’s Second Coming. It is simply a means to illustrate the lengths of time in God’s dealings with man and the approximate length of the ongoing Church Age which equates to approximately 2,000 years. 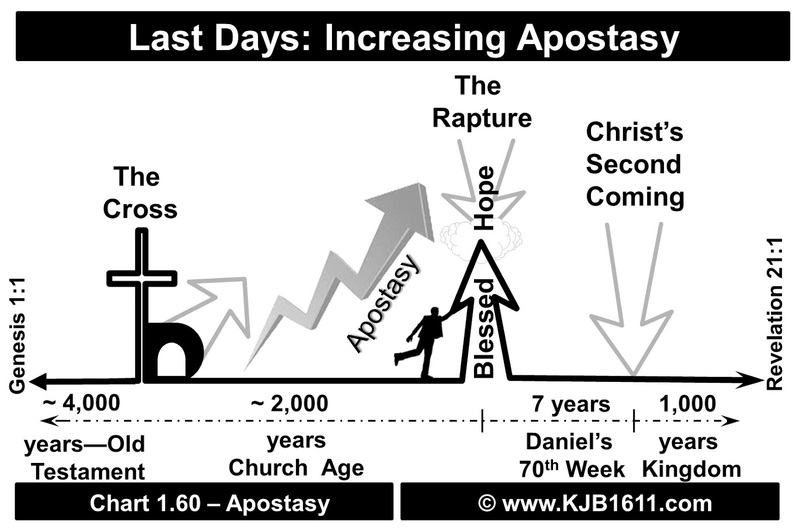 These “last days” or “latter times” of the Church are marked by a period of increasing apostasy just prior to the Rapture of the Church. This is why God’s open-ended biblical description of deception and godlessness are stated as becoming more wicked—worse and worse. This seems like a most definitive assessment of our current times as the world witnesses the disintegration of societal norms. The reason Paul and all Bible-believing Christians have believed in the imminent return of Christ at the Rapture is found in the first verse of the book of Hebrews. The writer of Hebrews acknowledged that the last days consist of the entire Church Age (a time in which God has “spoken unto us by his Son”). 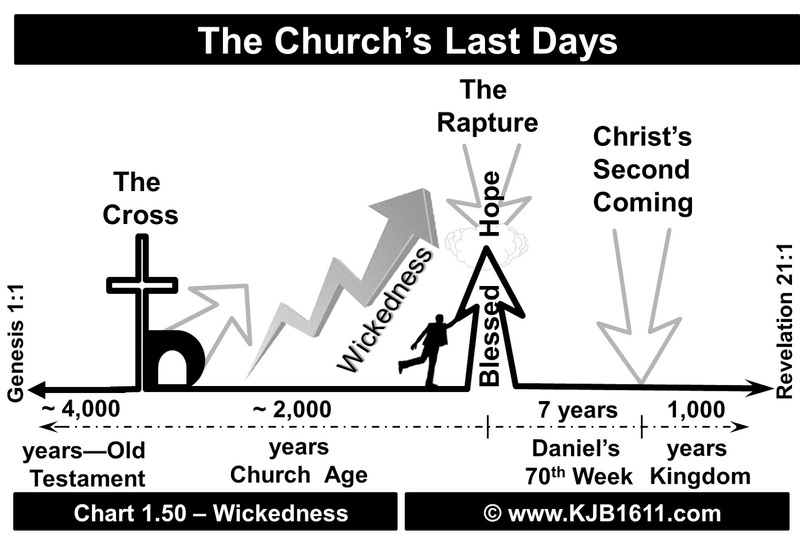 The Church has been in the last days since its inception. In fact, Paul so strongly anticipated the Lord’s imminent return that he incorporated the self-inclusive pronoun of “we” repeatedly to describe those who could be alive at Christ’s return for the Church (1 Thessalonians 4:15, 17). That’s imminency! Although the canon of scripture has been completed for almost two millennia, the illumination of God’s revelation contained within scripture continues to shine brighter with each passing day. This is because God knows His prophetic timeline. Throughout history, preachers and Bible teachers have viewed prophecy through the lens of personal perception. During the great revivals (or awakenings), when souls were being saved by the thousands, teachers and preachers commandeered the promises of Israel. They assumed the vast revivals would ultimately usher in the kingdom. 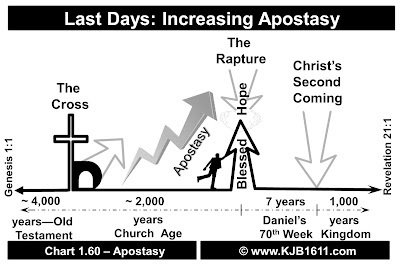 Although, they were truly witnessing some of the greatest days of the New Testament Church, they failed to understand that apostate times would follow and prevail. We are in those days. The previous generations were a great way off from the events we now see on our horizon. These events are staring us in the face. In the words of John, “Even so, come, Lord Jesus” (Revelation 22:20). It is not the intention of the authors to mathematically pigeon hole the Church Age into a 2,000-year period. Everything may point to this age winding down but only God knows when the Blessed Hope will take place ending this age rather abruptly. It is important to note that the Church Age could have ended any time during the last two millennia.